For every new diver, buying the gear is the final step, it’s what says “I’m willing to dedicate the time and money”. But if you’ve just finished your qualifications and got the open-water certificate, how do you know what to buy? It’s pretty much the same gear that you’ve used during training, only now it should be more personalized, and it should fit your body perfectly. 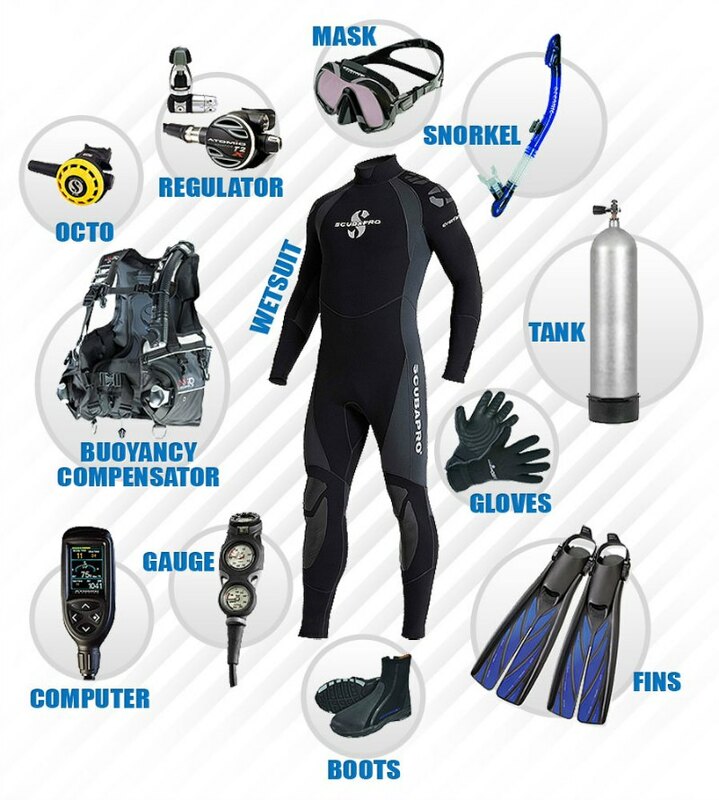 Every piece of gear is of vital importance, so when you look for scuba gear for sale, everything you set your heart on should be the perfect fit, else you might experience inconveniences while under the water, which might ruin the whole experience for you. You can ask your instructor about where you can find the best scuba gear for sale, and how much it will cost you approximately. Here are the essential pieces you’ll certainly need. The mask is what creates the air space in front of your eyes and allows you to focus under water. The nose pocket allows you to equalize air pressure as you go deeper. When buying a mask, you should look for a watertight fit, and in order to find the good fit, here’s what to do: look up and place the mask on your face without strapping it. Even like this, the mask should rest evenly on your face without any gaps. Next, place a snorkel or regulator in your mouth and see whether you have gaps now. Now look ahead and place the mask on your face without strapping it to your head again, and gently inhale through your nose – this should seal the mask to your face. As a diver, you want to save the air in your tank when on the surface. You should be looking for a comfortable snorkel – one that will feel good in your mouth and will allow you to breathe easy and dry. However, most attempts to keep the snorkel dry lead to them becoming harder to breathe through and bulkier. The right snorkel is a compromise of dry comfort and ease of breathing. Look for a durable, yet easy-to-operate and simple attachment. Exposure protection suits insulate you from the cooling effect that water has, which is 25 faster than that of air. The type and thickness of the suit you need will mostly depend on the diving conditions. You should be looking for a good fit and comfort in them, thus, being able to freely move while wearing one is key. Gaps at the leg, arm, neck and crotch allow the water to circulate and it will prevent the suit from keeping you warm. Why don’t fish have legs? Simple, they’re ineffective. Fins translate the power from the leg muscles into efficient movements through water, which is many times denser than the air. Efficiency and comfort are the key features you should be looking for in the fins. These things are determined by stiffness, design and size. Bigger, stiffer fins are recommended for people with strong hip and leg muscles. Less conditioned and inexperienced divers will be much better off with smaller, flexible fins.